This home is a perfect place for a young family. 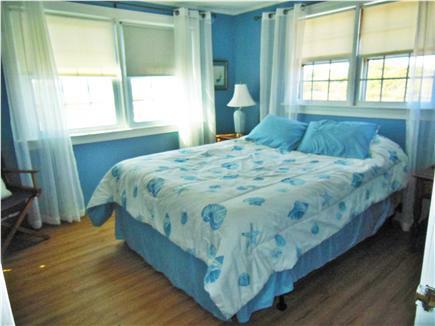 It's located in a quiet neighborhood on beautiful Cape Cod bay. The private beach is only a short stroll away, where children can enjoy the changing tides, running on sand bars and exploring the wonders of the sea safely without the worry of the oceanside undertow. 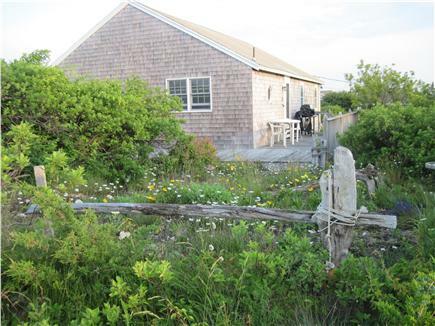 This home has a large deck with a spectacular view of Provincetown and the Bay. 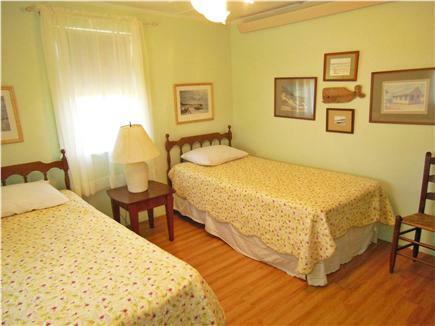 Located close to Highland Lighthouse,bike paths and golf course, only six miles from Provincetown. This ranch style home contains 3 bedrooms and 1.5 baths and an outdoor shower. 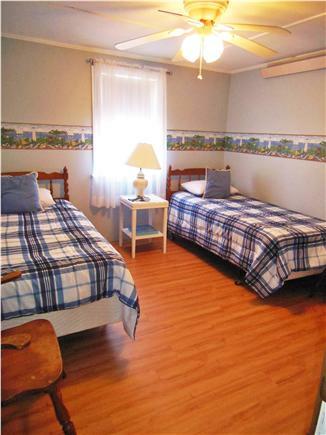 All rooms are comfortably furnished, and the kitchen is well supplied. This is a homey, family friendly cottage where you can put your feet up and relax. Everything you need to make wonderful family memories. We have opted for a Sunday to Sunday rental this year in hopes that it makes your vacation that much more wonderful, Not having to deal with the horrible traffic problems and delays that occur on Saturdays on Cape Cod can be a true relief! This home has all new flooring installed for the 2014 season adding to family friendly comfort! Additional pricing info: discounts available for multiple week rental, State and local taxes of 12.45% will apply. My family has been vacationing here for over 25 years. We enjoy having cookouts on the deck watching the sunset, using the private beach and swimming among the sand bars. My children have grown up here every summer with memories for a lifetime. The eat in kitchen and living room overlook the bay for very relaxing dinners. We hope to return for years to come. When this tenant contacted me with her concerns, I offered to have the cleaning service return to clean the house until she was satisfied, but she refused the offer. When she called two days later saying she wanted to leave, I offered her several options. She opted to leave and I refunded her a substantial amount of money. The cleaning service went to find out what the issues were. It is a reputable company that has been doing business for over 15 years. Bathtub drain was resolved that week (drain-o). 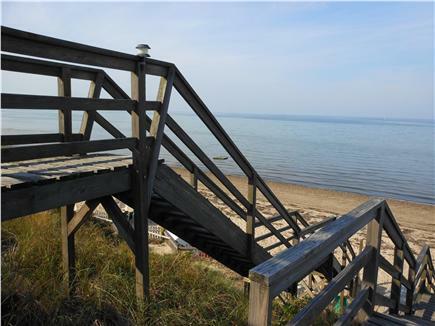 The house is advertised on the bay side, and the walk is about 50 yards to the beach path. I am committed to insure that you have a wonderful, stress free vacation. In over twenty years of renting there has only been one guest that was not thrilled with our home. It is not a fancy home but it is a clean and comfortable cottage with everything you need for a memorable vacation. If you are searching for a family atmosphere to relax this is the place for you! A large wrap around deck allows you to enjoy morning coffee or after beach cocktail with an outstanding view of Cape Cod Bay. Private beach access is one of the best features of this rental. No need to compete for space to lay out your towel , there are only three other families that share this beach space. Watch the tides come in and out and explore the sand bars at low tide. It truly does not get better than this! 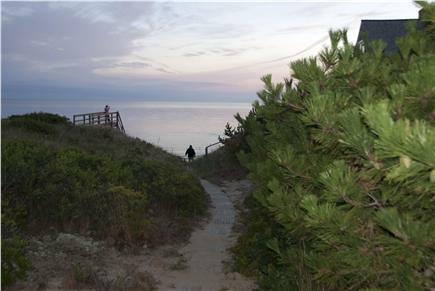 Location is great one mile from Highland light, 6 miles from Provincetown that has fantastic restaurants and shopping!